I'm currently a college student studying in Tokyo. Travelling is my passion and this is partly why I'm involved in this service! I've been to more than 20 countries over the past year and all of the experience I had so far is beyond amazing. I've had so many great memories through travelling around because I was lucky enough to meet people who live in the city and are so enthusiastic about sharing how great their place is and I thought - why not I do the same? So here I am, and I hope I could add a little something to your special stay in Tokyo! 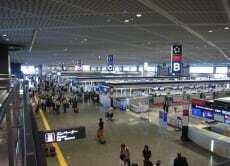 Transfer from Narita Airport to your Tokyo Destination! Akira waited for me at the Haneda Airport..my flight was delayed a bit but he waited and helped me catch the last train to Asakusa..if not i'll have to spend the night at the airport..he also assisted me in getting my simcard...we was very nice and speak English too! 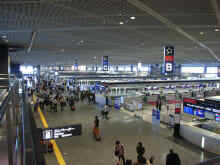 It was a great experience arriving at the Narita Airport on 25th Oct. We arrived early. Akira, unfortunately, had some urgent family matters to attend to, he had us connected with Sue for the pick-up. We also reserved (paid) for Ninja Wifi services (router, insurance, spare battery) days before arrival. On arrival, we went to pick up Ninja at 1st floor, Terminal 1, Northwing - left towards entrance (airport staff spoke very little English). There was practically no explanation as they claimed Ninja package notes were in English & we could read it all by ourselves. Sue was seated at the Meeting Point, I went over to him as Akira already sent me a rough picture of Sue. Sue actually introduced himself via emails prior to our arrivals. He directed us to JR office at the basement to execute our JR Passes. Meanwhile, he also told us to buy Suica Cards (we bought ¥5000/card), it would help with travelling around the places -- he knew our itinerary beforehand. We also got them at the JR office. He helped speak in Japanese so things went smooth. As Sue is a Japanese, he had to pay for the NEX (Narita-Express) since we wanted to take this service (faster to reach our hotel) as opposed to bus (¥1000). We paid for Sue's train fares (¥3400 approx). He actually surveyed our hotel surrounding before we arrived, Unizo Ginza Itchome, earlier. He showed us the way from Tokyo Station by foot. There were many restaurants & eateries around our hotel, the place is convenient, about 10min walk with trolley luggage, easy & smooth. He asked us if we had any other plans after checking-in. He brought us to a good Ramen store 3-5min away from Unizo. It was a nice, comfortable place for hot, non-oily Ramen. He helped us order what we wanted, it was a great 1st-night dinner. He sent us back to Unizo & we bid farewell & goodnight. He also followed-up with a thank you note (email). We still kept in touch when we arrived safely in Kyoto the next day. It was a great experience. We enjoyed our stay at Unizo, the hotel allowed us to keep our luggage while we were at Kyoto for 2 nights! Everything was smooth & steady. Thanks to Voyagin, thanks to Sue, who spoke & wrote almost perfect English. This was fantastic. Akira was super cool and so helpful. I definitely recommend this for everyone!